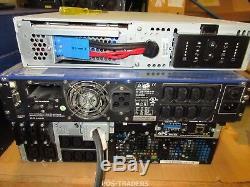 PULSAR EVOLUTION 2200 2U Rack 2200 VA / 1540 W 200/220/240V EU UPS USV 72VDC. Specifications above might be slightly different. INCLUDED BATTERYS ARE USED AND NOT TESTED! See photos for actual item! Price is for 1 item. Small LAN / file server. AC 160 - 294 V. 8 x power IEC 60320. AC 230 V + 6% / - 10% - 50/60 Hz. 1.54 kW / 2200 VA.
+ 6% / - 10%. AC 150 - 294 V. 4 pin USB Type B, 9 pin D-Sub (DB-9), RJ-45. LAN, management (RS-232), management (USB). Comes as shown on picture, if something is not on the picture it's not included unless stated otherwise. The item "PULSAR EVOLUTION 2200 2U Rack 2200 VA / 1540 W 200/220/240V EU UPS USV 72VDC" is in sale since Wednesday, June 13, 2018. 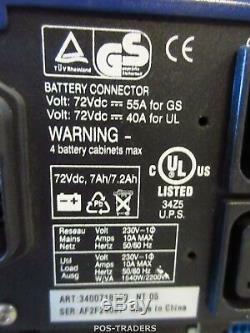 This item is in the category "Computer, Tablets & Netzwerk\Stromschutz & Stromverteilung\USVs". 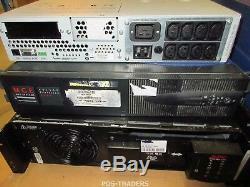 The seller is "pos-traders" and is located in Baarle-Hertog. This item can be shipped to European Union member countries, Switzerland.